Since 1994 Prof. dr. ir. 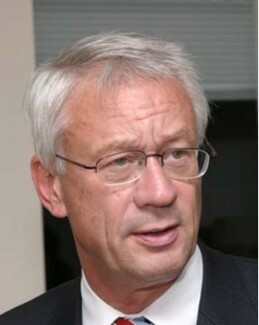 L.P. Ligthart was director of the International Research Centre for TelecommunicationsTransmission and Radar (IRCTR) as part of the Faculty of Electrical Engineering Mathematics and Computer Science (EEMCS) of the Technical University of Delft. Under his directorship, IRCTR focused its research activities into the specific areas of: antennas and propagation, radar technology, telecommunications transmission and microwave remote sensing. With support from the Netherlands Technology Foundation (STW) and national and international institutes, organisations and industries IRCTR started projects with research groups in the Former Soviet Union (FSU) to incorporate knowledge of those research groups into IRCTR on Polarimetric Radar Remote Sensing and on Ground Penetrating Radar. Prof. dr. ir. L.P. Ligthart received an Honorary Doctorate from the Moscow State Technical University of Civil Aviation for his contribution to knowledge fusion on radar technology from the FSU countries with existing knowledge in Western countries. He received an Honorary Doctorate from the Tomsk State University of Control Systems and Radioelectronics for his contribution to bring the research at that university at an international level. Prof. Ligthart has been responsible for the outstanding radar facilities on the roof of the almost 100 m tall Faculty building. Based on the request of Prof. Ligthart a new high-tech mm-wave facility was granted and installed inside a conditioned room. Tests up to 110 GHz of the AB-mm system and the HP system have shown that IRCTR is well prepared to step into the mm-wave arena. In modern radio and radar antenna arrays play an important multi-function role fulfilling demanding requirements in spatial and frequency domain. Most literature exists on so called ‘dense’ arrays with equidistant spacing between the antenna elements in the order of half the wavelength. In dense arrays designed for wide-angular scanning and high angular resolution, a large number of elements with individual transmit-receive modules is needed meaning that high gain dense antenna arrays are costly. Mutual coupling between the elements and wide-angular scanning requirements give degradation in wide band dense array performance and cause many headache problems for generations of antenna engineers. In the lecture the limitations in dense arrays get attention.